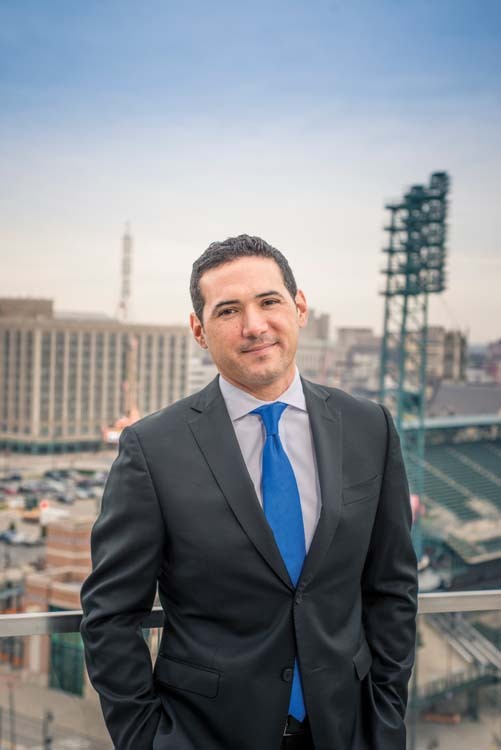 For the seventh straight year, Junior Achievement of Southeastern Michigan, in partnership with DBusiness magazine and News/Talk 760 WJR, selected six regional executives who are driving growth in highly competitive industries. Why did you leave the business world and take a risk on a new enterprise? I had learned a lot in the business world, and one of the maxims was that you take good care of your employees; they, in turn, take good care of your customers; and your customers bring in the revenue. Today we have 32 employees, and they work very hard to make sure the place is spotless — especially the bathrooms. If a mother or a father sees that you run a clean, first-class organization, they’ll be back. We have a lot of security with multiple cameras, and that gives parents peace of mind. We had 1 million people come through our doors last year, and with the (recent) addition of a new indoor arena, we’re planning on 1.3 million people this year. We’re also eyeing an expansion. What are your plans for the expansion? We’re talking to a number of different people, including a couple of local universities, about adding a multipurpose athletic complex on the west side of our property. We started with 16 acres, and we added another 16 acres. We’re open every day of the week, except for major holidays, and we have youth soccer, club soccer, high school soccer practices and tryouts, and adult soccer leagues. Our fields are also used for lacrosse teams and gymnastics teams, and at the end of April we’re setting up 38 volleyball courts for a major tournament. We even have weddings and graduation ceremonies here, including commencement for Lawrence Technological University in Southfield. Overall, we’ve invested $26.5 million in the facility. Are you looking at other growth opportunities? We’re looking at adding another location in Michigan, and we’re looking at opportunities in Florida and New Jersey. We have a permanent structure here, made of steel that is insulated, so it’s warm in the winter and cool in the summer. We won’t do an inflatable dome because they can’t hold up to cold weather and they can deflate — which is what recently happened at Eastern Michigan University. We’re in a very good spot because soccer and baseball have the most registered players in the United States, with each sport having 15 million players. If you look at football, there are around 7 million registered players. But the fastest-growing sports are lacrosse and volleyball, so we’re really on the cutting edge of the popular sports. We also did a lot of work when we selected the location of the complex. Our numbers show 70 percent of the registered soccer players in Michigan are within a one-hour driving distance of our facility. What attracted you to working with Junior Achievement? I like to work with and speak to young people, and JA is just a great organization. They really teach business skills to our youth. When I speak with the students about becoming an entrepreneur, I want to open their eyes to the real world and make sure they take the attitude that you never give up. I tell them, ‘Your workweek starts at 40 hours, and goes up from there.’ I work 60 hours (a week), and it was 80 hours when we first opened. I’d like to get that down to 45 hours. What else do you work on? We really like to support our seniors and veterans, so on Tuesdays we have a model airplane club come in and they fly their small planes and drones inside. From 4 p.m. to midnight, when the adult leagues are going, there’s a lot of activity here. I also sit on the board of directors of the Salvation Army in Pontiac, because so many of our residents are in need. The City of Pontiac has been great to work with, so we want to give back and help them any way we can. 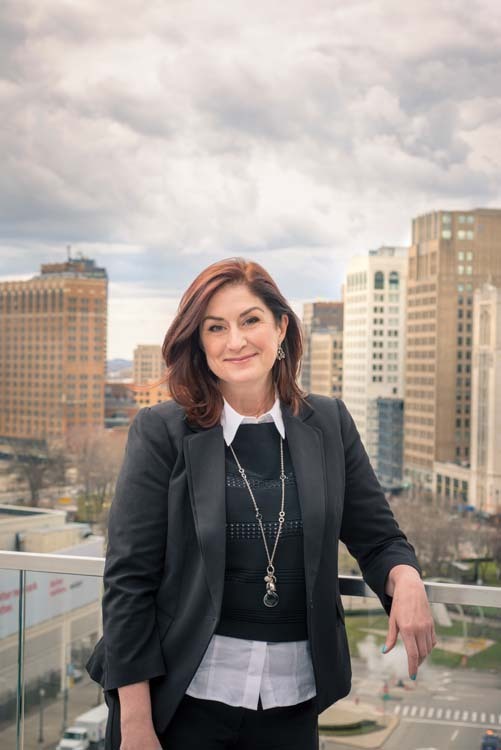 When M. Kathleen Donald graduated from Wayne State University in Detroit, she never dreamed she would return to campus one day and assist with plans to create a new business school for the university. 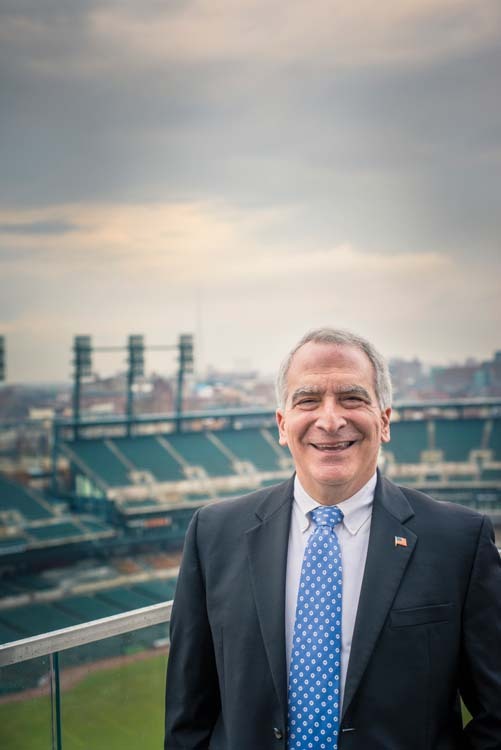 Soon after M. Roy Wilson was named president of Wayne State in 2013, he cited the need for a new business school, but said it didn’t necessarily have to be located on the university’s main campus. Rather, he said it should be built “downtown, where all the businesses are.” Donald, a member of Wayne State’s board of visitors, says the recently renamed Mike Ilitch School of Business, set to open in 2018 at the southwest corner of Woodward Avenue and Temple Street next to the new arena being constructed for the Detroit Red Wings, will improve student experiences. 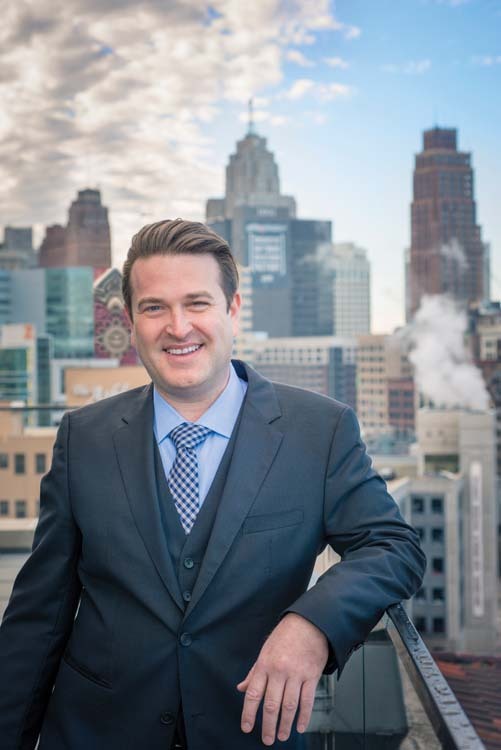 “The new business school is really in the heart of Detroit’s resurgence, and the students and the faculty are going to be right in the middle of everything that’s going on,” says Donald, general manager, Americas, at Dassault Systemes’ 3DEXCITE in Royal Oak (formerly RTT). “As a student, you couldn’t ask for a better setting.” She predicts the $50-million school, formally launched last October with a $40-million gift from Mike and Marian Ilitch, co-chairs of Ilitch Holdings Inc. in Detroit, which includes ownership of the Red Wings, will make the school much more competitive. “It’s going to help tremendously with the recruitment of students and faculty,” she says. How did your upbringing help your career? I grew up in suburban Detroit, and I’ll always have a soft spot for Wayne State because earning a business degree there did so much for me. Today I sit on the strategic committee of the board of visitors, and it’s really motivating because I have an insatiable need for curiosity and learning. I joined Dassault (in February 2015) to run their operations in North America (the company has its headquarters in Paris). It fit right into what I was looking for in terms of a place where communications and technology were colliding. We have a suite of virtual reality products, so we look at how we can leverage the technology at a time when it is disrupting what our clients are doing to promote, market, and enhance their brands. We basically take an array of data — including CAD data and simulation data — and strip away all of the engineering data, and then render it into 3-D images. So if our clients need a flat file for banner ads, or immersive experiences for one of their events, or immersive displays for their retail locations, everything is at their fingertips. What’s an example of your work? If you go to Facebook on a mobile device and type in GMC, you can see all kinds of amazing things that the company does to market their trucks, such as video. As you go through that Facebook page, it gets more and more immersive. In some ways, we’re just scratching the surface of what the technology can do. The longer you can have customers and potential customers engaged in your brandâ€…—â€…whether on Facebook, in a store location, or in another media format — the better it is. How did your career get started? Following college, I went into advertising and worked at a couple of small firms. From there, I worked for Ogilvy & Mather, primarily for the Ford Parts and Service Division, as vice president and director of brand planning. I also did business development. It was the early days of strategic planning, in terms of how customers make a decision and what is important to them. We undertook a lot of research. From there, the team running Ford of Europe wanted support on brand management, so I moved to London and worked on behalf of Ford in 18 different countries. It was a major opportunity, and I learned how business was done in different cultures, with different ideas and collaborations. When did you move back to Detroit? In 1998, (and the move) was due to a personal journey. My mom had breast cancer, and I wanted to be with her. I just wanted to be closer in case something was going to happen. She wound up living another 11 months, and it was the right decision to move back and be with her. From there, I joined Campbell-Ewald. My mom was a nurse at Pontiac General (now Oakland Medical Center) who worked days, and got her bachelor’s degree at night. She was a great inspiration to me. My dad was a master plumber, and he knew when he was 16 years old that he didn’t want to work for someone else. He became an apprentice and eventually a certified master plumber. It was great growing up, because you could see how the business evolved. When there was a lot of construction he had a lot of business, and when things slowed down he did a lot of service work. What did you do at Cambell-Ewald? I started out as an executive vice president in the account management group. At the time (in 1998), 85 percent of the work was for General Motors, so one of the things I was charged with was to diversify our client base. We pitched the account for the U.S. Navy, for example — and when we won it, there was a great deal of excitement. Over the course of my career there, I continued to pitch new business, help trouble-shoot accounts, and grow our overall business. We were invited to pitch the UASS business, and that led to a new office in San Antonio. When (former CEO) Bill Ludwig left in July 2013, I took on the COO duties. I did that for a year, until I got laid off in September 2014. I took a break of four months, which was good because I really needed the rest. But it didn’t take long to join the Dassault team. We work on a lot of automotive accounts, other types of transportation work, and companies like New Balance. For New Balance, they offered a real time platform where you could go into a store, access a kiosk, and customize a shoe from the sole up. That connected with their factory, and it was queued up on the assembly line of the factory floor, and your shoes were shipped within 10 business days. Two years ago, it was taken out of the store and we put the platform on the Internet. I actually bought my dad out (in 1997), and he worked for me for two years until he passed. I learned so much from him, especially how to deal with people from so many different backgrounds. The people we were selling food to were often immigrants who owned restaurants, and their customers were primarily blue-collar workers. After (my dad) died, I sold the business because I just wasn’t as interested in it anymore. So I retired, and had a retirement party. That lasted about three months, and then I got married and we had a baby, so it was time to get back in the workforce. So, with some partners, in 2000 I opened Abe’s Deli in Southfield, which is focused on corporate catering. It still operates today, although I sold my interest to the other partners in 2014. I had a great understanding of the blue-collar workforce as a kid, and Abe’s Deli introduced me to the corporate lifestyle and how people used food products at work. In full swing, we operated over a dozen locations in corporate cafeterias in metro Detroit, and we generated upward of $10 million (in annual revenue). While I was there, I started 365 Retail Markets as a garage business (in 2008). After it became successful, I couldn’t spend as much time as I wanted on Abe’s Deli, so that’s why I eventually sold my interest. At the start, 365 Retail Markets was a low-volume, low-revenue business. As the idea started to catch on that you could operate micro markets (small food and convenience stores inside large office buildings), I started to get some traction in 2010. From there it became a real business, and sales picked up and really took off in 2012. All my life I’ve been involved in the food business, so I never really had a boss. But being an entrepreneur, you find yourself spending a lot of time on everything. We started using RFID tags on every food product we sold, but then we took the technology and turned it into a bar code system. That’s when things really took off. The complex nature of RFID made it difficult to work with. It often slowed things down, and the technology wasn’t quite baked yet. When we had RFID tags on every single product, it would increase the price of each product by 15 cents to 16 cents. But when we switched to reading bar codes, it was much cheaper and simpler all the way around. We originally used RFID to reduce theft, but we found out that, basically, people are honest. What’s more, there are often cameras at each point-of-purchase area, and the buildings themselves may have other cameras. At the end of the day, the vast majority of people enjoy the convenience of purchasing food or beverages inside their buildings rather than having to go out somewhere. We’re a technology company that’s a service and support organization; we supply the technology, and we work with food providers like Sodexo or Compass Group. Basically, we provide all of the point-of-purchase equipment, including for mobile devices, so someone can buy a Coke or a salad at work. How do you match supply with evolving consumer tastes? While we don’t provide food, we can influence our food suppliers by providing analytic trends of what’s happening across the world. We’re a large provider of transactional data, so we know what’s being bought and we can get that information to our suppliers. One of the biggest trends is healthy food, gluten-free food, and sugar-free food — which, 10 years ago, would not have been on anyone’s radar. Some people like to use mobile devices as a way of payment, so our point-of-sale equipment can be operated by a cashier or, with the press of a button, it can go into self-service mode. We save our clients money on labor, and our customers love the convenience of checking out their items themselves. We’ve gone global by going into the U.K., and from there we’re getting ready for working in continental Europe. We also see a big play in Asia. We’ve introduced a new offering called Verii, which is geared to companies with 150 or fewer employees. Imagine an Amazon-style online marketplace where the point person at a given company can go to our website and buy food and snacks. We link that order to our network, and from there it’s fulfilled and delivered within 24 hours of receiving the order. We think Verii will be twice as big as our current business. There’s very little cost to get the program started, and we supply a cooler and a snack rack. The companies can charge whatever they want for the food and beverages, or they can provide it to their workers at no charge. It’s been very popular, and the follow-up orders have been strong. We launched it in January, and we have 25 accounts (since mid-March). We expect to have 1,200 accounts within a year, and we’ll just keep growing that part of the business. His father was a manufacturer’s sales representative for Broyhill Furniture and his mother was an interior designer, so Todd Sachse doesn’t know where he got the entrepreneurial bug. It happened early, with a window-washing company he owned and operated while still at Seaholm High School in Birmingham, followed by a maid and janitorial enterprise and, after graduating from the University of Michigan in Ann Arbor, he acquired a student rental property just off campus. “I was a good handyman, but not skilled,” says Sachse, founder and president of Sachse Construction in Detroit. “I could change a faucet, but I couldn’t build a house.” Sachse eventually acquired a parcel of land in Ann Arbor and set out to develop and build the 100-unit Ironwood Place Apartments. “I bought the land, hired an architect, hired a superintendent, and I became an assistant superintendent and learned everything I could. I had a lot of fun,” he says. A few months prior to finishing the Ironwood complex, in July 1991, Sachse subleased a 10-by-10-foot office and launched his construction business. Last year, the 130-employee firm completed 178 projects that, combined, represented $172 million in contracts and more than 1 million square feet of space. What was your first construction project? Once I got an office and a phone number, I tried to get people to let me build something. My first project was Cafe Jardin, which was a French restaurant right in the middle of the Somerset Collection South in Troy. I worked with architects Jim Ryan and Ron Rea. At the time, Somerset South was getting a second floor. The restaurant opened in 1992, and I was watching the construction every day and night. They actually built the second story at night so as not to disrupt daytime shoppers. I started to solicit some of the new retailers that were coming in, and we actually built out a store called Adrienne Vittadini. From there, I built more retail stores and restaurants, which is a third of our business; the rest is banks, office buildings, apartment buildings, and hotels, and we do some industrial projects like Ground Effects in Warren, which builds aftermarket parts for the automotive industry. What are you currently building? We just completed The Albert, which offers 127 apartments in Detroit’s Capitol Park, and we’re finishing up 45 new apartments at the Lofts of Merchants Row (on lower Woodward Avenue). We’ll open The Scott in Brush Park at Woodward and Erskine, which will have 199 apartments, and DuCharme Place in Lafayette Park, which will have 185 units, later this year. We’re also converting the former Detroit Fire Department headquarters across Washington Boulevard from Cobo Center into the 100-room Detroit Foundation Hotel, which will open in 2017, with developer Walter Cohen and his team. We also have projects in Hawaii at the International Marketplace on behalf of Taubman Centers Inc., as well as performing tenant coordination services at the Beverly Center for Taubman in Beverly Hills, Calif., where we coordinate all of the tenant construction. We’re also building a flagship H&M store in Puerto Rico. How do you manage so many projects at once? All of our superintendents are full-time Sachse team members who are well-trained. They’ll move to a project and live there until it’s completed. We treat them well, and that inspires a lot of loyalty. We handle all the bidding, estimating, and project negotiations right here in Detroit. I have weekly meetings with my direct reports, we have a lot of planning and strategic meetings, and we rely a lot on technology. We really focus on inline stores — the ones you see all in a row within or outside a shopping mall. We’ve built stores for Armani, Versace, Lilly Pulitzer, Nike, Gap, Hugo Boss, and Tiffany, and we did the John Varvatos store in downtown Detroit. We’re also working on the Nike store in downtown Detroit (which will open in the spring). At any given time, we have 40 to 50 projects under construction, another 25 to 30 that are in pre-construction, and close to 20 that are completed and are going through the final paperwork, which is called a closeout. What other companies are you involved in? 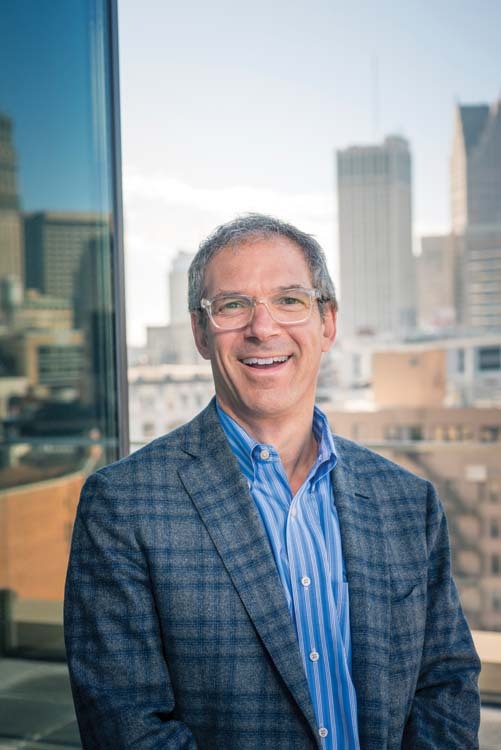 I recruited Richard Broder from Farbman Stein (now Farbman Group), and we partnered and started Broder & Sachse Real Estate Services, which is a commercial real estate investment, development, and property management company based in downtown Birmingham. I spend half of my time at Broder and the rest on the construction side, which includes Zolman Restoration in Walled Lake, which provides restoration services to major property insurance firms; Brewster Maintenance in Birmingham; and Stuart Mechanical in Madison Heights. All of the companies are named after relatives. We’re coming off the best first quarter in the history of the company. Normally, the first quarter is a little slow, but we were fortunate to win a lot of bids for new or renovated retail stores. As for new real estate developments or investments, we look at geography and the markets we serve, and then we look for the fast-growing areas in the country. That’s why we’re very active in places like southeast Tennessee, in Chattanooga and Knoxville. We like it there because it’s in the same time zone, it’s easy to get there by plane, and it’s a growing area. We’re also looking at entering the Columbus market, and we have some great projects coming up in southeast Michigan. 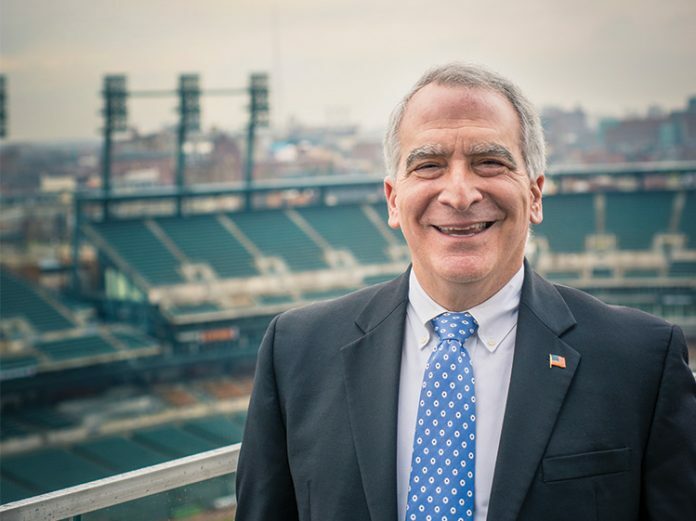 It’s exciting to be part of the regrowth of Detroit, and I can say our team is really excited to be working all over downtown, Midtown, and other areas of the city. As more people work and live in the city, it will drive the development of more stores, restaurants, and entertainment venues. Nationally, you’re seeing more people talk about the positive things happening in Detroit. That’s gratifying. What was it like starting a business in college? It was pretty cool. Like I said, (there was) a problem between (my) roommates and myself in terms of who was going to collect the money, pay the bills, and then square up with one another. I saw a problem that seemed very fixable. So I created a system and a service to fix the problem. But the funny thing is, the solution to that problem wasn’t what Billhighway became. What really helped me was that I started the business when I was younger. I learned that it’s OK if you fail in (a) business. We were successful and lucky enough to make it, but starting your own business, owning your finances, and learning how everything works is a great experience. At 21 years old, in my senior year, there wasn’t a lot of risk starting my business. I had a beat-up Ford Explorer and myself, so I didn’t have a lot to lose. If I failed, all I had to do was go out and find a job. You learn things growing up in a family business, as well. It gave me the confidence to start a business when I was younger. If I hadn’t been exposed to that, I don’t think I would have had the confidence to launch a business. How did you scale the business? My original idea was to fix the problem of students sharing expenses via a set of online tools. In the beginning, I didn’t have a marketing budget to support what was a business-to-consumer operation. But a year into the business, I noticed there were these larger groups on campus like economic clubs or fraternal organizations, and I learned they had similar problems with collecting money from students. So I started learning more about those groups, and I started selling my services to them. Instead of getting three or four clients at a time, I was going after these larger groups. Then I realized a lot of the college-based organizations were one part of multiple chapters around the country. After three and a half years into the business, I landed a $500,000 annual account for a 13,000-member group out of Texas that generated $30 million a year in revenue. It was my big break, and I started hiring people. Today, we serve over 6,000 organizations in the U.S. and Canada that represent millions and millions of members. How much value do you place on a vibrant work culture? Culture is the most important thing. We look at it as the business needs to fit the culture, instead of the culture fitting into the business. We have a playbook with eight plays, or what other companies might call their core values. Our plays are very actionable. Everything we do starts and ends with those plays, in terms of the products we create or the hiring process, where we place more value in a person’s culture than their skills. The plays focus on who we are and how we can successfully grow the company. If you came in for an interview, we would ask you what you feel about the plays and how you (can) fit into our culture, rather than focusing on your skills as an accountant or a human resource manager. We have 75 team members here. We also have company outings or competitions every single month, including a potluck lunch, bowling, and family events. We have large events every quarter. We also have a Billhighway Olympics each year, which is a week-long set of games where we pick teams, flags, and colors. It’s a very fun, hilarious team-building week — and while we work that week, we intertwine our work with games like chair races around an obstacle course in the parking lot. We also have sing-offs and dance-offs, where people do their best impression of their favorite performer. How do you keep from growing too fast? We never talk about that. We look at progress at any rate as a great thing, and we could never grow fast enough. Whatever comes our way, we figure out a way to make things work. We deal at the highest level of the client organizations we work with, and a lot of them have local affiliates, or groups, or entities, so it can be a challenge at first. Just last year we signed a deal with a large organization out of Washington, D.C., that had 50 affiliates and 3.5 million members. We were looking at ourselves and saying, “OK, how are we going to scale this up?” So we got together and mapped it out and developed a strategy. That’s what business is all about. You don’t slow down; you make responsible decisions and you get to work. What did you learn from playing college baseball? I played center-field in college, but during high school I played football, basketball, and baseball. I can say I learned a lot about business playing sports. I think playing sports is the best example of learning to manage success in life and business. You need to be competitive, you learn how to compete, you need to be a team player, and you learn how to be a leader, how to step it up, and make it happen. When I was running the business by myself, I couldn’t wait to hire people and work in a team setting and be a team player and a leader. We could expand outside North America. As the global economy begins to shrink, we see opportunities around the world, and we look forward to taking on those opportunities. Edi Demaj has a different perspective about what drives the entrepreneurial spirit. 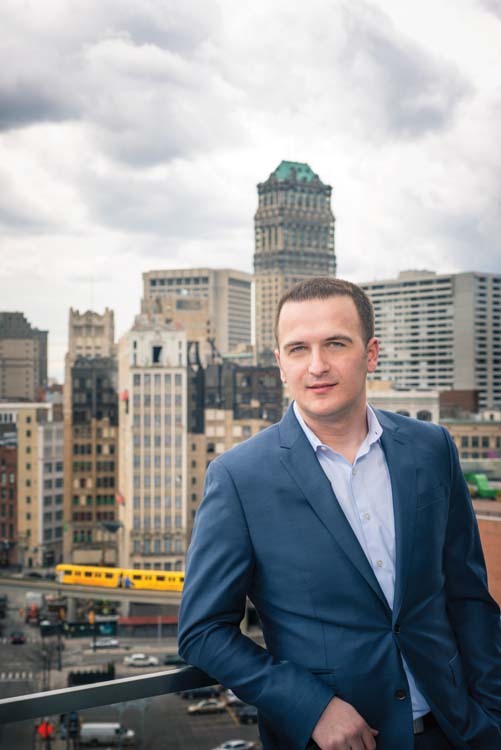 In 1999, when his family fled their homeland in Kosovo due to the horrific war and established residency in the United States, Demaj says he was so grateful he couldn’t sleep. “Once everything is taken away from you, anything new (that) you try is easy,” says Demaj, co-founder and COO of Rocket Fiber, a high-speed Internet provider in downtown Detroit. “You don’t think about success or failure; you just enjoy working hard without distractions.” After earning degrees in political science and business management at Oakland University in Rochester, Demaj worked in a variety of real estate positions at Grand Sakwa Properties Inc. in Farmington Hills, followed by a stint at Bedrock Real Estate Services, a sister company to Detroit-based Quicken Loans Inc. When Google Fiber launched the installation of high-speed broadband services in Kansas City in 2013, Demaj, along with two colleaguesâ€…—â€…Marc Hudson and Randy Foster — envisioned a more robust high-speed network in Detroit and beyond. Rocket Fiber is where I spend my full week, with my partners Randy Foster and Marc Hudson. The three of us manage different areas of the business on a day-to-day basis, but we always come together and make the bigger decisions as managing partners. We started this company because we wanted to build an advanced technology infrastructure that helps breathe new life into the city we love. Detroit used to be the hub of technological advancement and entrepreneurship, and now it’s coming back in a major way. We believe that what we’re doing with Rocket Fiber will help attract new ideas and companies that will create jobs and make Detroit and Michigan the center of world innovation. Reozom.com is an exciting company that I helped co-found with my younger brother, Etrit Demaj, and a partner of ours, Justin Tibble. We saw an industry that had not evolved from the way it operated 50 years ago, and we wanted to find a way to streamline it and make it more transparent. We have built a platform that makes the home buying and selling process easier, faster, and more affordable. The daily operations are managed by Etrit and Justin. Other ventures I have helped start or have invested in are iziSurvey, a software platform that allows users to develop custom surveys — online and offline — while lowering data-collection costs, and Gjirafa.com, the first and only Albanian search engine with more information about the region than any other existing search engine, including Google. Gjirafa is the fastest-growing brand and the most visited platform among Albanians worldwide. Where will Rocket Fiber be in five years? Our goal is to change the way people interact with their Internet and cable provider. We want our clients to think of Rocket Fiber as their friend and partner, rather than someone they don’t want to talk to. Every team member at Rocket Fiber is accessible, starting with the founders. We’re currently building our fiber network for businesses and residents in downtown Detroit and Midtown, as well as working on expansion plans around Detroit and in surrounding cities. In five years, Rocket Fiber will be in multiple cities; closer to home, we see Rocket Fiber as a modern-day assembly line for Michigan that helps attract innovation and creates jobs. We went from three co-founders to 30-plus team members in a year. Bringing everyone up to speed, and making sure we’re giving everyone enough time while continuing to build the company, has been one of our big challenges. With time, that has gotten a lot better, and our team has made building this company easier and more exciting than we ever expected. We also have new office space, and we have everyone on one floor, which is more efficient. How do you balance your work schedule so each venture receives the proper attention? The short answer is because of the amazing people I am surrounded by. Rocket Fiber is my full-time job, and where I spend the majority of my time. I have incredible partners in everything I am involved in who handle the day-to-day operations of the other companies I’ve co-founded or invested in. My brother is involved in all our ventures outside of Rocket Fiber, which makes my life easier. It allows me to look at the other ventures from a different perspective, and to provide advice from shareholder and board-level positions. Never get comfortable with anything that you do — whether it’s learning, working, sports, or anything else. The minute you get comfortable and feel like you know it all, that’s exactly when you start falling behind. Surround yourself with great people because we are all the average of the people around us, and everything else will follow. Last but not least, there are no shortcuts in life. It takes hard work and perseverance to be successful and to make an impact. What business leaders inspire you? Dan Gilbert (founder and chairman of Quicken Loans, who financially supports Rocket Fiber) has been my greatest inspiration. His ability to see decades ahead of others (and) live what he preaches, (together with) his leadership style, amazes me. I’m a big dreamer, and back in 2011 when I started working for Dan’s real estate company in Detroit, I would constantly think of things I could do to get a chance of working closer with him. To have him invest in a company I co-founded is beyond a dream come true for me. Having the opportunity to learn from Dan is worth more than any bachelor’s or master’s degree I could have gotten. Others that I watch closely and would love to sit with and gain knowledge from are Marc Cuban, Kevin Plank, Richard Branson, Elon Musk, and Robert Herjavec. Our honorees were photographed on the new Rooftop Plaza of the Detroit Athletic Club, added last September to the historic building designed by renowned architect Albert Kahn. The glass-walled space of 9,386 square feet offers a casual restaurant, a pair of meeting rooms as well as a bar and cigar lounge; and remarkable views of the downtown skyline.